We’d heard that there was a canine theme to the show, but Topshop Unique also told us that they’d be taking inspiration from buildings and ‘the age of the automobile’. Not knowing quite what to expect from the always innovative label, we battled traffic and rain to head east to London’s Old Billingsgate Market on day three of London Fashion Week. On the way over, rumour spread that there was iced tea and brownies at the show. And Alexa Chung. Needing no further encouragement, we politely suggested that our lovely driver ‘step on it’ in the Marie-Claire-Mobile and pulled up outside the grand show space just in time. The fragrant Ms Chung, already in situ and nibbling delicately on a brownie (yes, really), was swiftly joined by front row stalwarts Pixie Geldof, Nicola Roberts and Nick Grimshaw as well as industry big wigs, Anna Wintour, Sir Philip Green, Sir Stuart Rose and BFC and Jaeger chairman Harold Tillman. 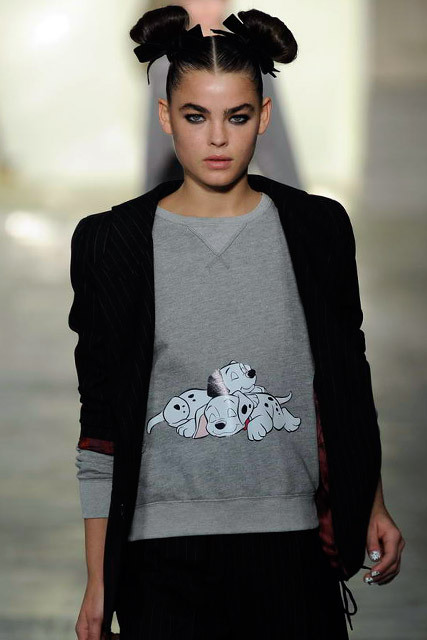 As the lights dimmed, the sound of dogs barking started to open the show, mixing into the theme for Cruella De Vil. So far, so fabulous. 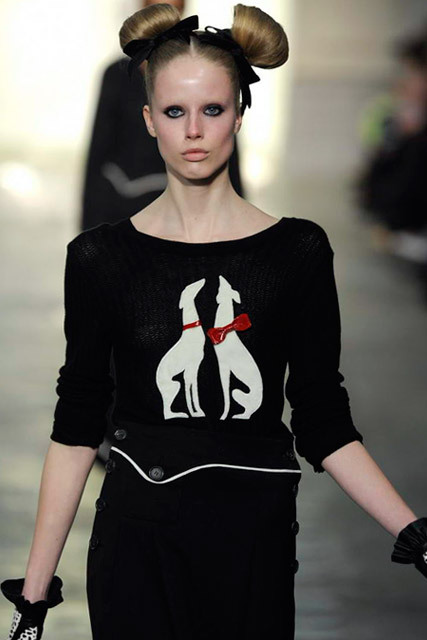 The models stepped out with their hair in top knots to look like dog ears and their noses painted black (a look we’re considering for day four…). The dog motif continued with whippets, greyhounds and, of course, dalmations emblazoned on T-shirts, shoes, bags and even patterned silks. 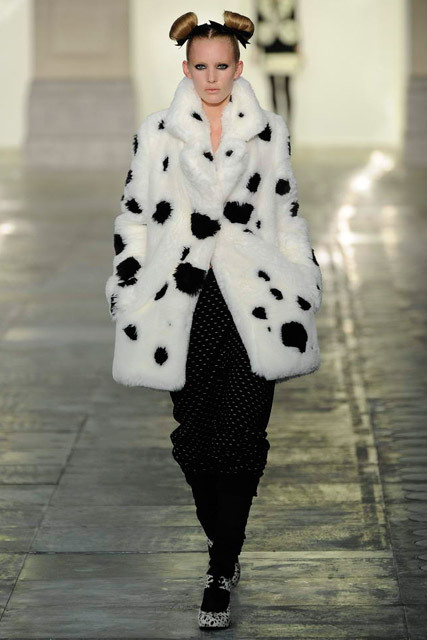 Fur featured heavily with dalmation print faux ponyskin, oversized faux fur hemlines, sleeves, collars and a sumptuous black sheepskin coat with chocolate brown fur collar. The collection conjured up 1930s America, with bold, beautiful prints, luxurious fabrics and sleek silhouettes. A monochrome palette gave the collection an art deco feel with iconic buildings such as Brooklyn Bridge immortalised on a devore dresses along with sky scrapers printed on silk blouses. Finishing off the look for A/W’11, models wore patent Mary Janes, T-bar peep shoes and, of course, platforms – all available soon online at Topshop.com.